A bobcat (Lynx rufus), one of the three main predators of fawns in PA, walks into the sunlight. #whoseatingbambi: how does carnivore-carnivore interactions and distributions influence fawn distribution, density, and survival? Because they want to survive, deer often see a forest as a landscape varying in safety. This landscape of fear depends on the habitat, the time of day, and the predator that prey avoiding. Throw in more than one predator, all differing in what areas they use, how they hunt, and when they're active, and then how those predators influence each other, and you have a very complicated chessboard to navigate! And how predator habitat use and space-time interactions influences fawn density and the number that make it through the summer. The fosa (Cryptoprocta ferox) is the largest native predator in Madagascar, and severely under-studied. How many fosa are there in Madagascar's largest protected area complex, Masoala-Makira? Madagascar's unique carnivore family (Eupleridae) is severely understudied. For many species, population estimates are lacking, which makes it very difficult to correctly determine how threatened they are. Although a colleague, Brian Gerber, estimated fosa density in Ranomafana National Park, no one had determined how many fosa there were in Madagascar's largest protected area: the Masoala-Makira complex in the northeast. Using fifteen surveys across seven sites, I led the effort to determine how many fosa were in the region using a group spatial mark-resight model. We found that there is likely about 1,000 adult fosa in the protected area (as little as 600 and as many as 1,800). This means that the Masoala-Makira protected area is home to a significant number of the fosa left in the world. We hope that our research will lead to stronger protections in the region. A Madagascar crested ibis (Lophotibis cristata) stares at the camera trap. Can we use extra camera trap data to provide new information for little-studied species? Camera traps are awesome because they take pictures of EVERYTHING that walks in front of the camera, ranging from cows to mice. Across fifteen surveys in Masoala-Makira, we got thousands and thousands of pictures of birds, small mammals, and a (mainly) Madagascar-exclusive insectivore group called tenrecs. I decided not to let that data go to waste. Using occupancy analyses, I looked at what influenced where we saw five ground-dwelling forest birds (like the crested ibis), two rodents, and two tenrec species. We found that we were less likely to detect many of the bird species if we saw a lot of feral cats in the area, and that red forest rats (adorably rusty-colored pudgy rodents) were detected more often further from the forest edge. I advocate for using all of the data that one gets from camera traps, because you never know what new things you'll learn! A young male white-fronted brown lemur (Eulemur albifrons) calls a warning. Are lemur densities different between undisturbed and disturbed forests? In addition to running fifteen camera trap surveys in Masoala-Makira, we also ran lemur surveys on forest paths that we walked night and day. All told, we got over a thousand observations of lemurs, including critically endangered species like silky sifaka and indri, while walking over 1,000 kilometers! I estimated the density (# of individuals per square kilometer) of three lemur species, including the white-fronted brown lemur, which is only found in northeastern Madagascar. 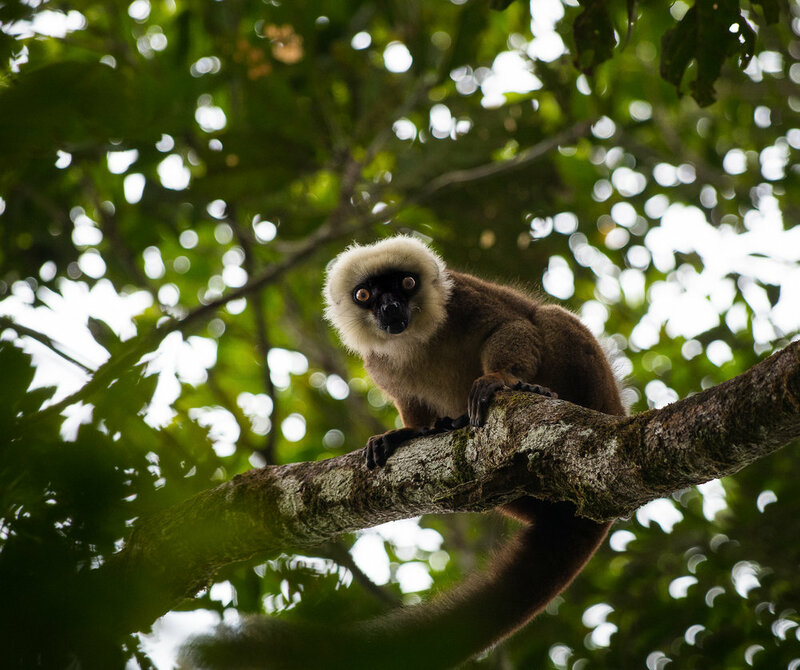 We provided the very first statistically-rigorous population estimates of these three species for the region, and found that you were less likely to observe lemurs in very disturbed forests compared to undisturbed forests. Much like with the fosa estimates, we hope that these numbers will help strengthen protection for this biologically important region.